If you are not following Ed Brill, well you should, but also, that means that you missed this link that he posted. It's a new commercial that's being shown in-flight Virgin Atlantic flights. I thought it's pretty cool. Some time ago (probably over 2 years ago), our internal blogging system changed their rating mechanism. Now, instead of giving 1-5 stars to a particular entry, you could only give it a star or not. In other words, we went from having 6 choices, to two choices (to give or not to give a star). At the time the decision was explained with some internal metrics.. basically, a "big majority" of people were rating content with 5 stars or none at all. It was mostly a binary decision. More and more this decision has been validated by other social networking providers like Facebook and YouTube. Several months ago, Facebook added the ability to 'Like' a post, thus giving users a binary decision.. Either you like it or not. Great videos prompt action; anything less prompts indifference. I think that's how I feel most of the time. It's not whether or not I like the content. It's whether the content is really worth recommending to others or it was so good that it deserved "a reward". Plus having a 5-star rating system gives me too many choices (specially if you can do stuff like 3.5, 4.5, etc). It really requires some thinking to decide between a 4, 4.5 or 5. That's why I like the "binary" rating systems better. It's easy. It's fast. Still, I see a lot of Enterprise 2.0 RFPs asking for a 5-star rating system. I wonder if that's a hard requirement or just based on what the RFP writers see out there. And wonder if this requirement will soon start disappearing. How about you? Do you like 5-star rating systems? Or do you prefer binary rating systems? Or perhaps trinary rating systems such as Digg/Bury/No action, Thumbs Up/Thumbs Down/No Action? Does it matter if it's inside the firewall vs outside? Here's a nice demo of the Sametime Broadcast Chat capabilities. Broadcast Chat capabilities are part of Sametime Advanced and integrate very nicely with Lotus Connections Communities. I think the video does a very good job demoing the need for real-time collaboration, which is often missed by the social tools. That's one reason I like this functionality so much. It adds a sense of real-time communications to existing social software platforms. I'm working with a customer right now that wants to deploy Lotus Connections externally (i.e. outside of the firewall). I got an interesting question for them and didn't see the answer documented in the InfoCenter. Therefore, I decided to post it here in case I need to reference it later (or in case it's valuable to you). The question was around viruses in file uploads. Since this will be available in the internet they were concerned about users who may inadvertently (or knowingly) upload a file. Out of the box, Lotus Connections supports antivirus services that work on ICAP (Internet Content Adaptation Protocol) 1.0 such as McAfee Web Security Appliance and Symantec Scan Engine. How to configure the antivirus for Lotus Connections is documented in the InfoCenter. However, it's not clear what happens when an infected file is uploaded. Is it automatically deleted? Is the admin notified? Is the user notified? etc. Therefore, I asked one of our developers and got the answer. 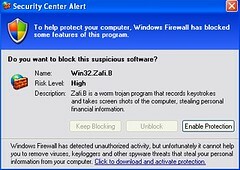 Action on the file actually depends on how the antivirus system itself is configured. If the antivirus system is configured to clean the files, then the files will be cleaned and then saved normally. If the antivirus is configured to delete infected files, then the file is never saved by Lotus Connections. Regardless, the user is notified of an error while uploading their file. One of the tools that I love to use with my customers is video. Specially videos that tell a story about the business value of social software. Yo may remember that in the past 2 weeks I've posted two videos on the business value of blogs and Lotus Connections. Yesterday, Lotus launched their Lotus Knows campaign. Lotus Connections gives you a bird’s eye view of what your colleagues are working on. So you can quickly assess synergy with your own work. You can view more videos like this here. What's your favorite one? A colleague, Delphine Remy, put togethers this wonderful presentation that explains the business value of microblogging both inside and outside of the firewall. It starts by talking a bit about Twitter and its importance in external communications. One of the things that I liked about the presentation is that it actually provides 5 different ways to use microblogging. Additionally, it provides examples of how IBM is using tools like Twitter and Lotus Connections and how we are embracing microblogging to improve our business processes. This presentation was delivered last week at the Digital Media event in Barcelona. View more presentations from delphRB. I'm going to be speaking at the IBM Federal Mashup Day Event on October 22, 2009. The topic? Social Software inside the Government. Below is some information on the event. If you are near the Washington, DC area, I strongly encourage you to register and attend this event. Unlock data sources, transform information and assemble mashups. Learn how to unlock and easily view a wide range of information from multiple sources. In just minutes you can simply point-and-click, using a visual, browser-based tool, and assemble new applications, including feeds and widgets. Improve employee productivity by empowering self-service application development to address daily work challenges. Attend our half-day seminar and learn from the experts about the value of mashups for federal government. To register for this free event, click here. Hope to see you there! IBM and SuccessFactors have joined forces to provide a unique talent management and social software solution that helps boost productivity and drive top-line results. Attend this live webcast to learn more and see a live demonstration showing the integration of SuccessFactors and IBM Lotus Connections. You will see how the combination of social data with talent management helps people discover the skills they need for critical projects as well as helping executives align the organization's skills with their strategy. For dial-in and web conference information, please visit this page in the Greenhouse. See you there! This is another great story from Jean-Francois Chenier on the business value of internal blogs for an enterprise. If you missed Jean-Francois' first video, you can find it here. I think these videos with real use-cases are essential for promoting adoption of social software in the enterprise. Therefore, feel free to use them as you plan your roll-outs of Enterprise 2.0 tools in your organization. I wonder who Jean-Francois meant as the "guy who knows about cool things" ? This week I had the pleasure to set up 3 different Lotus Connections 2.5 environments, and assist in a migration of a 4th. The most interesting install was at a customer site where they wanted to integrate Windows Authentication with Lotus Connections (a.k.a SPNEGO/Kerberos). The idea is that each morning an employee logs on to their Windows desktop and authenticates against an NT domain. Then a user launches Connections and magically they are automatically signed on! I hadn't done a SPNEGO / Lotus Connections installation in a while, but read the documentation and it seemed pretty straightforward. To enable SPNEGO authentication with Lotus Connections, I followed the steps documented in the Lotus Connections InfoCenter. The actual setup is not that bad. One part must be done by the Active Directory administrator and another part is just some WebSphere configuration. The WebSphere configuration took about 10-15 minutes. One thing I wished the InfoCenter had was screenshots. However, as we were getting ready to do this deployment, we used Lotus Connections internally to find an expert in this topic. And we found Purvi Tivedi who wrote this awesome article, step-by-step & complete with screenshots. Of course, now I have tagged Purvi and bookmarked her document so I can find them later. After restarting the server, SPNEGO didn't work. We actually spent 2-3 hours troubleshooting it. We noticed that there were a couple of technotes on the topic, but they didn't seem to apply. Finally, the light bulb went on. Our setup was against the customer's QAACME domain, and the user had logged on to their desktop under the ACME NT domain. We logged out the user, logged back in under the right Windows NT domain, opened a browser to Connections and it worked! Have Twitter? Have Lotus Connections? Want to microblog in both at the same time from one single place ? Starting today, you can! You may remember that I gave a preview of this client back in June. At that point, Lotus Connections 2.5 was still in beta. Now that Lotus Connections 2.5 is officially available, Bluto, has been released to the world. Yes, even non-IBMers can download and use it with their own Lotus Connections server. I don't want to make this blog post long, so I'll just share a quick screenshot and a link to where you can download it! For instructions and a link to download the code, go to Jason Feinstein's site. Jason is the original developer of Bluto who did 99.9% of the code and I did the other .1% work (i.e. enable support for Lotus Connections). 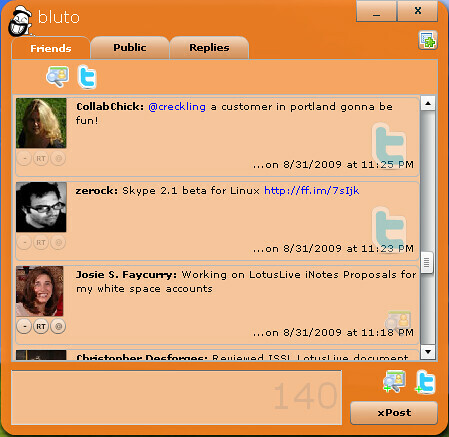 That's right, he did such an awesome job architecting his original microblogging client that it was a piece of cake to add Lotus Connections support for it. Of course, it also helps that Lotus Connections has a pretty powerful microblogging API. So, make sure you send Jason a quick Tweet to express your gratitude for this phenomenal piece of work. Note: This is just something we did for fun, and it's not officially supported by us.